Today October 18th is the Feast Day of St. Luke the Evangelist, patron saint of physicians and artists. And so I pay special homage to him with this wood sculpture. Artistically I have tried through composition and subject matter to place St. Luke in the center of his mission. 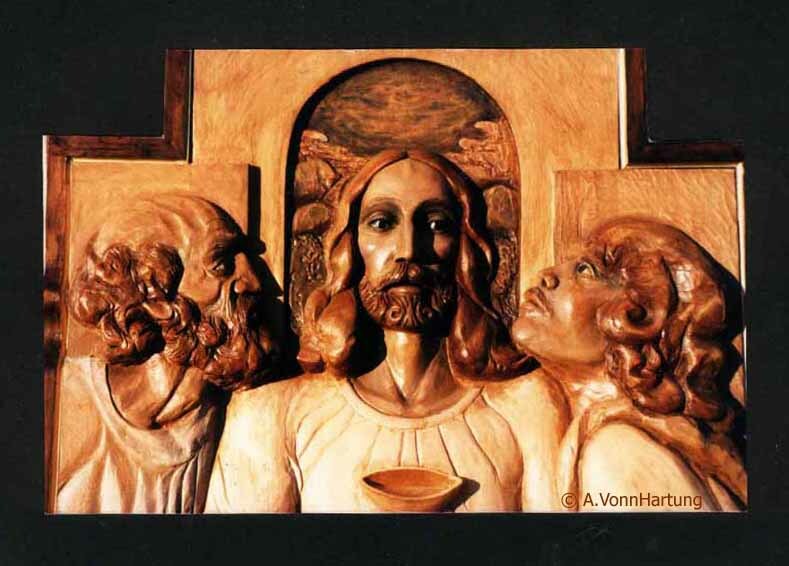 I have also attempted, in the style of this wood carving, to give a feeling of the harmony brought to him through the gift of the Holy Spirit. The tempestuous backdrop witnesses to his shipwreck with Paul (Acts 27:13-42) and the many trials and tribulations he experienced struggling to keep pace with him on his missionary journeys. Luke holds his written witness in a book (gospel) that looks much like we might perceive a paperback because of the dynamics of his perilous travels with Paul.